December 5, 2018, Omaha, Neb.— The Metropolitan Utilities District (M.U.D.) board today approved a 2019 budget with no increase to natural gas rates and an increase to the water rate, resulting in a projected overall decrease to the average residential customer’s combined annual gas and water bill. 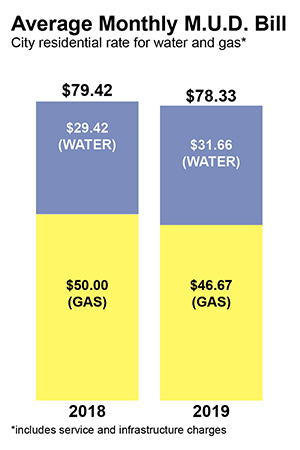 The average residential water customer’s bill is projected to increase $2.30 per month, or $27 annually. However, combined with lower natural gas costs, the average residential customer’s total bill is projected to decrease $13 a year. A low-use residential water customer is projected to see a smaller increase than the average customer, about 50-cents a month or $6 annually. The District estimates 2019 revenues of $138 million for the Water Department and $193.4 million for the Gas Department. The revenues will be used to fund the District’s operating expenses, gas purchases, debt service costs, capital improvements, cast iron pipe replacement and to maintain reasonable cash reserves. Directors approved the 7.9-percent increase to the average residential customer water bill, which is recovered by a 19-percent increase to the commodity (usage) component of the bill. The customer service charge and water infrastructure replacement rider will not be changed. The new commodity rate is effective January 2, 2019. The increase will generate approximately $11.3 million of additional revenue to support the replacement of critical water main infrastructure; there is no increase required to fund ongoing operating expenses. Each main break costs approximately $14,200, or $7.5 million a year. The new infrastructure replacement layer of the commodity rate, coupled with the existing water infrastructure rider, will provide long-term revenues to accelerate the District’s water main replacement program and to reverse the negative main break trends. The water industry best practice is to replace 1-percent of water mains per year which equates to about 30 miles of the District’s total 2,900 water mains. “These funds will allow us to ramp up the replacement of our water infrastructure from the current rate of seven miles a year to eventually 30 miles a year, while focusing on our most critical infrastructure,” Doyle said. No natural gas increase for the second consecutive year. Gas usage for the average residential customer is budgeted at 781 therms in 2019, compared to 774 therms in 2018. Despite the increased usage, a lower cost of gas will be passed along to customers, resulting in lower bills. An average residential gas customer will see a projected decrease of $3.32 a month or about $40 a year. Water use for the 2019 average residential customer is budgeted at 106 CCF (79,288 gallons), the same as in 2018. A customer with a 5/8 inch water meter will see a projected water bill increase of $2.30 a month or about $27 a year. “We strive to find a balance between rate increases and operational efficiencies, while ensuring that we remain affordable and continue to responsibly invest in infrastructure,” said Chief Financial Officer Deb Schneider. As compared to other U.S. utilities that participated in the 2018 Memphis Light, Gas and Water Survey, the District ranked fourth lowest in cost for residential gas bills and 15th lowest for residential water bills. “Even with the approved rate increase, we believe our affordability ranking will be minimally impacted, in light of the fact that infrastructure replacement funding needs are being addressed throughout the nation,” Schneider said. M.U.D. is one of the few water utilities to operate a system with three water plants, which significantly enhances reliability and the ability for the communities served by the District to grow. M.U.D. provides safe, reliable and cost-effective natural gas and water services to our community. We serve drinking water to 214,142 customers in the metropolitan Omaha area and maintain 27,000 hydrants for fire protection. The District’s water meets or exceeds all federal and state standards for drinking water. The District also is the fifth largest public gas utility in the United States, serving natural gas to 229,365 customers. We are a public utility and proud to be customer-owned. The District is governed by a board of seven directors, elected by our customer-owners. Visit www.mudomaha.com for more information.